The ground around your building should slope away from your foundation. Roof downspouts should extend two metres away from the sides of a building and be angled to direct stormwater away from your foundation and your neighbour’s property. Always ensure that leaves and other debris do not block eavestroughs, downspouts, ditches or storm drain access on your property or the street. 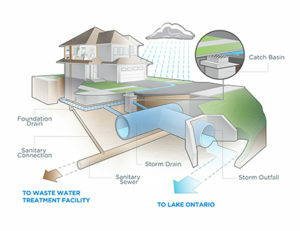 Blockages lead to water ponding and can be a cause of flooding.